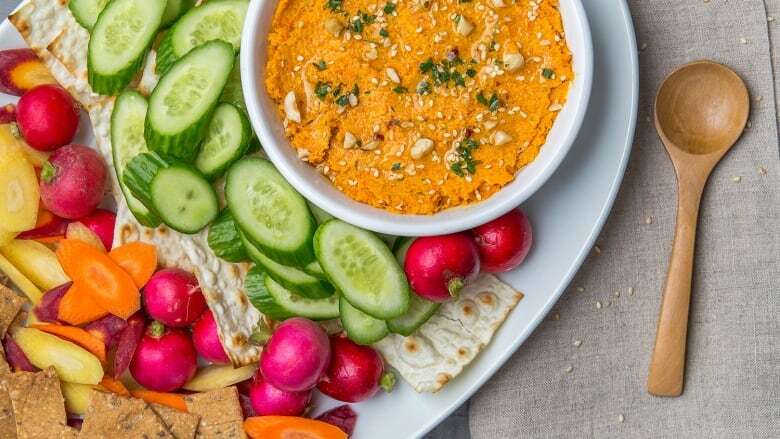 A nice change from traditional hummus; in this dip, rich roasted carrots take the place of chickpeas. The spices and toppings are inspired by the Egyptian spice blend dukkah. Preheat oven to 400 degrees F. Toss carrots with 2 tbsp oil and season with thyme, cumin, coriander, turmeric, paprika, fennel, salt, pepper, cinnamon and cayenne. Arrange carrots in single layer on baking sheet lined with parchment paper. Bake until tender, about 25 to 35 minutes. Cool to room temperature. Add carrots, tahini, lemon juice, 2 tbsp oil, water, garlic, ginger and honey to food processor; puree until smooth. If too thick, thin with a little more water. Season with salt and pepper, to taste. Serve with a sprinkle of hazelnuts, parsley and sesame seeds on top. Drizzle with olive oil. Serve with crudite, crackers and breads. Store hummus in an airtight container for 3 days in fridge, or freeze in airtight container for up to 2 weeks. For a creamier dip, stir in a few dollops of plain Greek yogurt. You can also serve with a sprinkle of store bought za'atar seasoning.